Over the next decade a billion more young people will enter the job market across the world – but 387 million children globally are set to leave school without the basic skills needed to get on in life. At a time when half the world’s children leave primary school unable to read or write, International Development Secretary Penny Mordaunt will announce today (Friday 2 February) that the UK is stepping up its work to tackle this “terrible waste of potential” as she attends a global education conference jointly hosted by France’s President Macron and Senegal’s President Sall. Over the next decade a billion more young people will enter the job market across the world – but 387 million children globally are set to leave school without the basic skills needed to get on in life because teachers aren’t well-prepared for their roles, and struggle to access the support or resources they need. In Dakar, Ms Mordaunt will announce the UK’s commitment to the Global Partnership for Education (GPE) – and will set out how it is conditional on countries’ governments reforming their own education systems. By encouraging radical improvements to education systems, the UK is supporting young people to get good jobs, and contribute to the future stability and prosperity of developing countries, so they can become our partners of the future. It’s also reducing the risk young people are forced to turn to crime or to search for a better life outside their own country – which directly impacts the UK. This follows the UK-France Summit last month, when Prime Minister Theresa May and President Macron named 2018 the Global Year of Learning. This year-long partnership will see the UK and France working together, calling on donor countries and partners to step up to tackle the ‘global learning crisis’. It’s a terrible waste of potential that half the world’s children leave primary school unable to read or write because the quality of teaching is so poor. We need an education revolution, but to succeed in tackling this global learning crisis, we will not just need to be open-hearted – we need to be hard-headed too. The UK will lead the way by supporting countries’ governments to fundamentally overhaul their education systems to make sure they can ultimately step up and provide a good education for their own people. All children deserve a decent education to make the most of their talents and to help lift themselves and their countries out of poverty – building a more prosperous and more stable future for us all. Ms Mordaunt will say that the UK is focused on helping developing countries drive up standards in their education systems and ultimately take responsibility for investing in their own people, rather than depend on aid. Although huge progress has been made in recent years improving access to education with 89% of children now in school, many teachers aren’t properly equipped to teach basic knowledge and vital skills. UK aid has led the way, supporting 11.3 million of the world’s poorest children in primary and lower-secondary school between 2011 and 2015.
bringing education to the hardest-to-reach children, so that marginalised girls, those with disabilities and children affected by conflict are not left behind. As set out by Prime Minister Theresa May and President Macron at the UK-France Summit, the UK is increasing its partnership with the French tackling serious threats and maximising opportunities in the Sahel region of Africa. During her visit the Secretary of State will visit a school and a family planning clinic in Dakar, to see how the UK is helping Senegal serve its rapidly growing population, and stimulate economic growth which is creating jobs and future prosperity across the country. The International Development Secretary will today pledge £225 million to the Global Partnership for Education. This represents an almost 50% increase compared to our current annual contribution and maintains the UK’s position as the one of the largest country donors to the fund. As previously, we will cap our final contribution at 15% of the total replenishment amount. 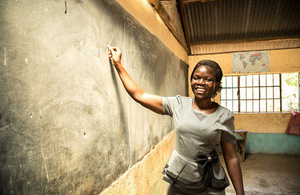 One third of DFID’s pledge will be conditional on GPE reorganising to focus on key improvements – such as making sure education systems are making better plans for teaching provision, improving methods for testing students’ progress, and making more grants conditional on countries raising teaching standards. As DFID’s multilateral reform agenda sets out, it is crucial that organisations such as GPE are accountable for achieving a real impact in the countries where they work. The Secretary of State’s new commitment to tackling the global learning crisis is set out in DFID’s 2018 Education policy, published today. Teaching quality is the single biggest factor in getting children learning – but in many African countries, the majority of primary teachers do not have the minimum levels of literacy or the teaching skills they need to teach their classes. As a result, globally, 56% (387 million) of children are not on track to read well or do basic maths by the end of primary school. In low income countries, almost 90 percent of children will not learn even basic skills in literacy and numeracy. 69 million teachers will need to be recruited by 2030 – that’s more than the current entire population of the UK. It’s vital to make sure these teachers are properly trained and equipped to provide a quality education. Huge inequalities persist in global education – 63 million girls aren’t in school, children with disabilities struggle to access any useful education, and children affected by conflict and crises all too often miss vital schooling. DFID is acknowledged as a global leader on education. Between 2012–2015, the UK spent an annual average of £966 million per year on education. Between 2015-2017 DFID supported 7.1 million children to gain a decent education. This included at least 3.3 million girls. The Government of Ghana is working with GPE and DFID to drive up quality of education in the poorest rural communities, including improving teacher quality and attendance. Over the past two decades, Ghana has seen dramatic increases in school enrolment and in the quality of basic education as well as in getting more children into school. Thanks to extra teacher training through T-TEL (Transforming Teacher Education and Learning), Irene has massively improved her method of teaching, delivers engaging lessons and is an inspiration to her students. She also makes sure girls and boys participate equally in all her lessons. She’s now sharing these methods with other teachers at her school and carries out regular evaluation and training. Because of improvements in Ghana’s education system, Ruhainatu is getting the quality education she needs to achieve her ambition of being a nurse, so that she can return to help her community which was once devastated by cholera. 2 February 2018 First published.